Basque cuisine has a long history in the western United States, but many chefs across the country have recently discovered the unique ingredients and storied history of the region that straddles northeastern Spain and southwestern France. 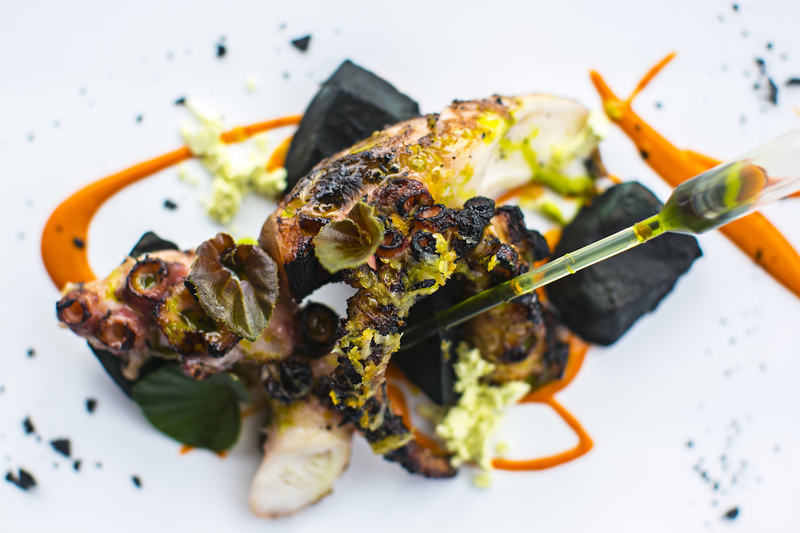 Traditionalists will revel in the regional flavors that mark Basque cuisine while modernists will exult in new interpretations that are emerging from forward-thinking chefs around the country. Here are eight Basque-inspired dishes that celebrate the culinary flair of la cocina vasca. 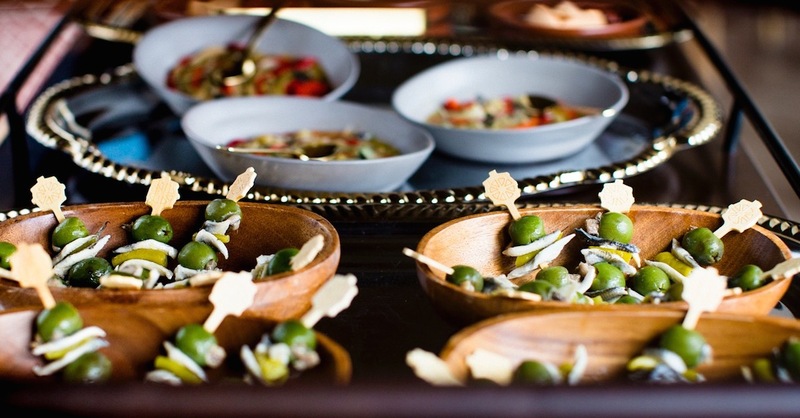 Named for Rita Hayworth’s femme fatale character in the 1946 movie Gilda, this traditional skewered snack of Castelvetrano olives, anchovy, boquerones, and pippara pepper from chef Ryan McIlwraith is the perfect introduction to Basque cuisine. Rather than having to roam the neighborhood, trying snacks at numerous spots, the team at Bellota bring the pintxos, or small snacks, to you on a cart. 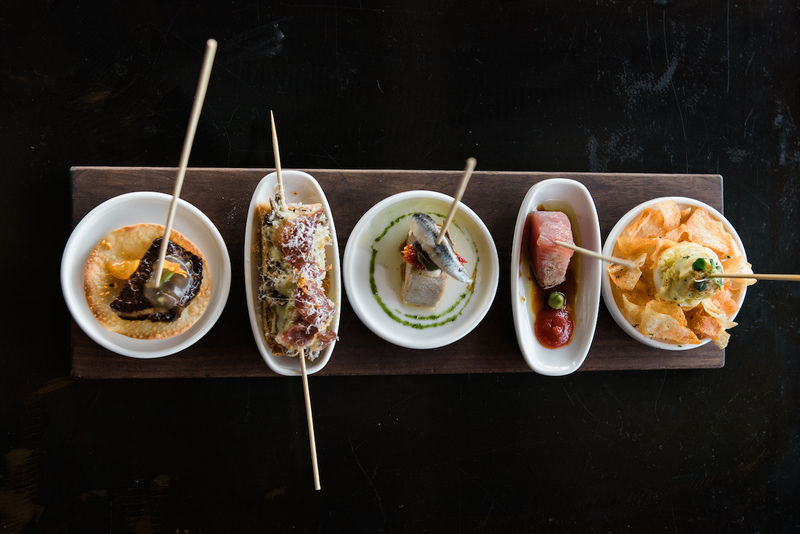 Gilda pintxo is traditionally served at the start of the evening, a first taste of the heady flavors of Basque country. Make a reservation at Bellota. Every year, the city of Barcelona invites its restaurants to compete for the title of Tapa of the Year. Just before opening their blended Basque-Catalan outpost in America, Teleferic Barcelona won with their tapa, Ma Premeire Foie. Grilled and caramelized foie gras swaddled with a bit of cherry jam in house made toast reaches nirvana with caramelized red onion and a slick of apple mousse. Refresh your palate with a hit of Basque cider, served as a special off-menu item, straight into your mouth from the traditional Basque porron. It’s enough to make a Euskaldunak swoon. Make a reservation at Teleferic Barcelona. Its name a tip of the hat to the Tamborrada festival in San Sebastian and the citizen’s defiance towards Napoleon’s occupation, Cooks & Soldiers looks for ways to add contrarian flair to traditional Basque dishes. Pigs in a blanket, a.k.a. chistorra in a blanket, melds Basque and Southern ideas of dough-wrapped sausage. Basque chistorra sausage gets bundled into a cider-glazed croissant and served with a mustard-maple dipping sauce. Or swing vegan with tomato tartare. 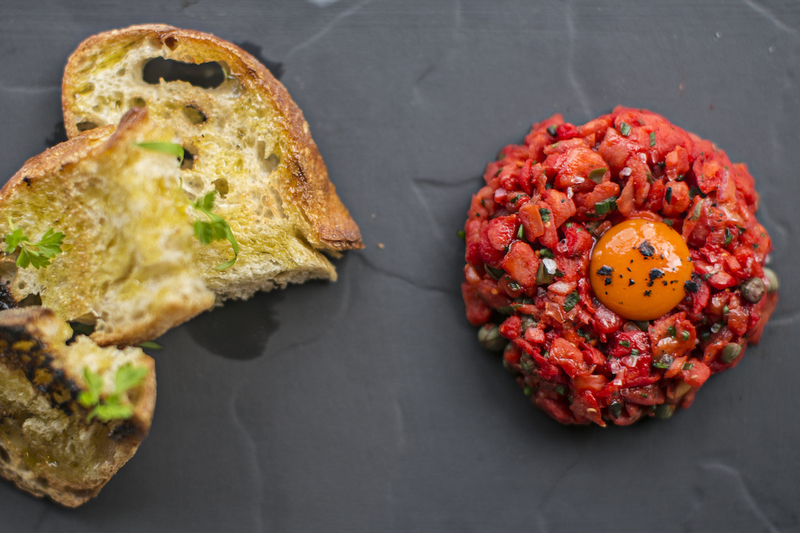 Chef Landon Thompson reimagined trendy tartare with in-season cured tomatoes, draining the bright red veg to give them a beefy texture and topping the tartare with a modernist, algae reverse purification carrot “yolk.” Once local tomatoes are gone, so too, this seasonal dish is gone. Basque food never had it so good. Make a reservation at Cooks & Soldiers. Chef Ben Lefenfeld at La Cuchara loved the communal dining atmosphere of Basque pintxo bars and set out to recreate that vibe at La Cuchara, where a 40-seat square bar is the heart of the festive space. And, like traditional asadors in the southern Basque region, Lefenfeld does much of his cooking with fire. A signature, asador-inspired dish is his veal tongue bocadillo. 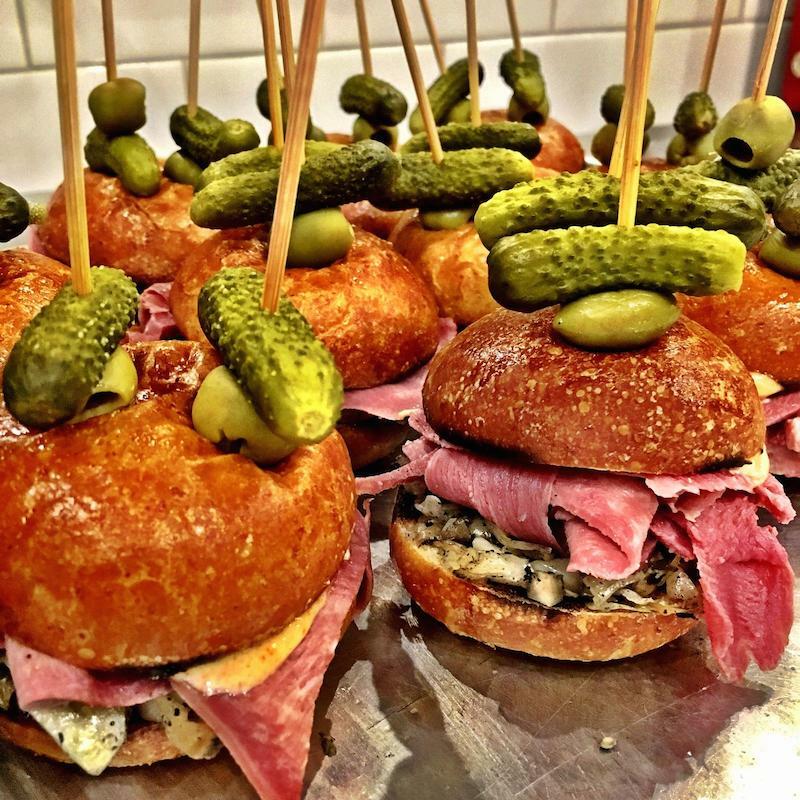 Brined for seven days, the tongue is braised then sliced as thin as possible and served on a charred cumin roll with charred cabbage, pimentón aioli, and espelette pepper. The sandwich tastes of Basque food at its finest, an ideal blend of French, Spanish, and Basque flavors, reflecting the seasons and the flavors of the region. Make a reservation at La Cuchara. Caroline Potter is the Chief Dining Officer for OpenTable, Inc. She’s a dining trend-spotter and an OpenTable VIP, who dines out more than she eats in and has accrued more than 10,000 Dining Rewards points. Caroline started working in restaurants as a teen and she's since tackled every front-of-the-house job, from bartender and hostess to runner and server. She trained as a chef at Manhattan’s prestigious French Culinary Institute, cooking at L’Ecole. In addition to her role at OpenTable, she has written about food from farm to table for New York City’s famed Greenmarket and Edible Brooklyn and Edible East End magazines. Caroline is also a Certified Master Gardener.